Rep. Ken Horn knows how to get people’s attention – for better and worse. Horn is the author of Michigan’s new welfare reform, which cuts recipients off cash assistance after they have received 48 months of benefits in their lifetimes. Because the law is retroactive, more than 11,000 families will lose their cash benefits the same day, when the policy kicks in next month. In a story in Bridge Magazine Thursday, Horn, described in blunt terms what he believes those losing their benefits should do. “They’ll pick up a a hammer or a paint brush and man up and feed their family,” Horn said. 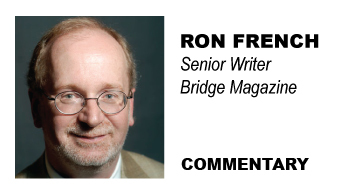 That simple Q & A has become Bridge’s second most-viewed article in our magazine’s short history, and sparked heated comments both in support and against the Frankenmuth Republican. In a state with some of the highest unemployment figures in the country it's easy for the people who lack critical thinking skills and, thank God have maintained employment, to make flip statements about; "manning up." We cut safety nets for people while we engage in corporate welfare for companies that ship jobs overseas. Desperate people do desperate things. Many have heard about the man that robbed a bank for a dollar so that he could be sent to prison to obtain health care. Pay me now or pay me later. Most do not realize that people will get their needs met. If we do not provide health care for the masses then they show up in the emergency rooms which increase the costs for the rest of us. I pay premiums for 35 employees and their families and the rates have gone up by double digits, every year, for over a decade. It's largely unsustainable now and we are becoming a nation that continues to increase the amount of people that are uninsured. In the Great Depression the government came up with a jobs program that we still see the benefits of today in many of our National Park systems. I have walked over many of the Civilian Conservation Corps bridges and walkways. Employed people pay taxes which could reduce the deficit far better than the desire to cut spending largely caused by two unfunded wars and large tax cuts given away. Now we are demonizing teachers, firefighters and police officers because they have a middle class wage and pension. Wake up people. Those same people you are accusing of being lazy are standing in lines for jobs that are not there. If you drive them over the edge you have sacrificed your brothers for the wealthy pundits on Faux News who want to stay that way. If you really believe in the Constitution of the United States it says; "We the people........." not; "We the corporations............" Our brothers and sisters are hurting. What happened to our Christian values that many of us were raised with?